Do you want to know which web hosting is the best choice: Bluehost or DreamHost? Both Bluehost and DreamHost are popular web hosting services on the market. In our UNBIASED comparison between DreamHost and Bluehost, we’ll help you figure out the best choice for your budget and needs. Bluehost and DreamHost are both officially recommended web hosting providers by WordPress.org. Bluehost was founded in 2003 and was acquired by Endurance International Group in 2010. DreamHost was founded in 1996 and is still independently owned and operated. Both Bluehost and DreamHost have a lot in common. For example, their hosting options run the gamut from cheap hosting, WordPress hosting, VPS hosting, to having your own dedicated server. They also offer a free domain name, free SSL, 1-click WordPress install, and a massive discount on web hosting plans. Page speed and server uptime are the 2 most critical factors you need to consider when choosing a web hosting service. Nobody likes a slow website. In fact, your users will abandon your site if it takes too long to load. On top of that, Google continues to emphasize speed in their search algorithms, so it’s an essential factor for SEO as well. Uptime is a term used to describe the period that your website is available and operational. Usually, uptime is expressed as a percentage of the total available time; “99.95%”, for example. To test the speed and uptimes of the hosting servers for our DreamHost vs Bluehost comparison, we signed up with both hosting servers and built a test site with WordPress. To mirror the production environment, we also installed a default WordPress theme, added dummy content, and uploaded some images. Our DreamHost test site loaded in less than half a second, which is faster than 97% of all tested sites. To test how these hosting servers handle visitors during a traffic surge, we used a testing tool called Load Impact. For our Load Impact test, we sent some virtual users (VU) to our site and gradually built up to 100 visitors at a time to see how the servers would handle it. Both our Bluehost and DreamHost sites performed well without any trouble. For our Bitcatcha test, we analyzed server response times around the globe by ignoring the content of our sites. Our Bluehost test site was rated C by Bitcatcha whereas the DreamHost site was rated A+. 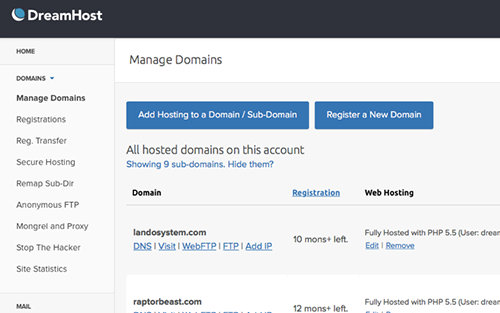 Built on cPanel, Bluehost comes with a custom interface to easily manage your website and hosting resources. 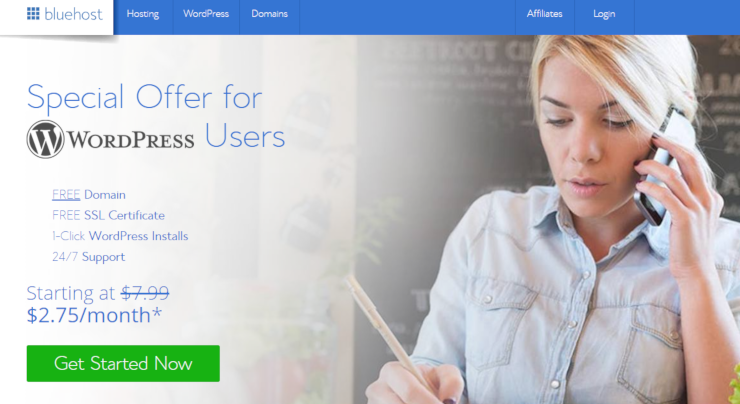 To improve user experience, they also revamped their dashboard, so now it’s easier than ever to get your site up and running with Bluehost. DreamHost, on the other hand, doesn’t use a cPanel dashboard (the most popular control panel) to manage your web hosting account. If you’re accustomed to using cPanel, then there’ll be a bit of learning curve to tackle before using the DreamHost interface. Bluehost offers 4 different hosting plans for shared hosting. Their basic plan lets you host a website whereas the Plus plan enables you to host unlimited sites. DreamHost only offers 2 hosting plans for shared hosting: Starter and Unlimited. The only difference is that, with Starter, you can host 1 website and, with Unlimited, you can host as many websites as you want. However, they don’t provide marketing offers, site backups, or a dedicated IP with any of their shared hosting plans. Bluehost’s friendly support team is available 24/7 via live chat and phone. 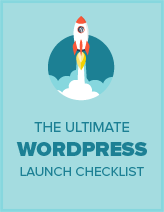 Their in-house WordPress experts can quickly solve any hosting-related issues you may have. They no longer provide ticket-based support, in an effort to focus on providing personal and direct support through phone and chat. In their knowledge base, Bluehost has a vast array of articles that’ll guide you through every aspect of building a site. DreamHost only offers support via live chat during 5am – 10pm PST, 7 days a week. That means, if you’re in a different time zone, then resolving your hosting issues via live chat could be a hassle. Even worse, phone support is not offered for free. Although call back requests are available, you’ll have to subscribe to it separately either by making a one-off payment or purchasing a monthly subscription. Both Bluehost and DreamHost offer a vast array of hosting options that meet your budget and requirements. For affordable hosting, you can choose one of their shared hosting plans. As your site grows, you can upgrade your hosting to VPS or even a dedicated server. DreamHost $2.59 /mo. $2.59 /mo. $16.95 / mo. $13.75 / mo. $169.00 / mo. Compared to DreamHost, Bluehost’s introductory plans are slightly more expensive. However, after the introductory pricing period, Dreamhost renewals will be priced at the full regular price, which is higher than that of Bluehost. If you’re looking for an affordable solution, in the long run, Bluehost is your best bet. Bluehost and DreamHost are 2 popular hosting providers on the market. 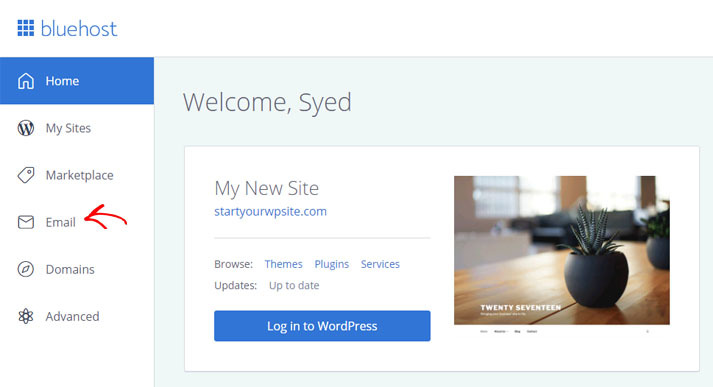 Both are officially recommended hosting providers by WordPress.org. From our comparison, we found that Bluehost is the best web hosting for anyone who wants to build a website, regardless of the size of their website and budget. We hope this article helped you choose between Bluehost and DreamHost. For more details, check out our complete Bluehost review and DreamHost review.